Bureau of Land Management Replaces Mountain Field With Coal In Homepage Photo : The Two-Way Critics were not kind to the Bureau of Land Management on social media. The agency says it plans to rotate photos showing various uses for federally managed lands. A quiet change to the website photo banner of a relatively obscure federal agency is causing a bit of an outsize stir on social media. On the top of its home page, the Bureau of Land Management, which manages more than 200 million acres of public land under the U.S. Department of the Interior, swapped out a photo of a young boy and his companion backpacking across a mountain meadow in favor of one showing a massive coal seam at a mine in Wyoming. 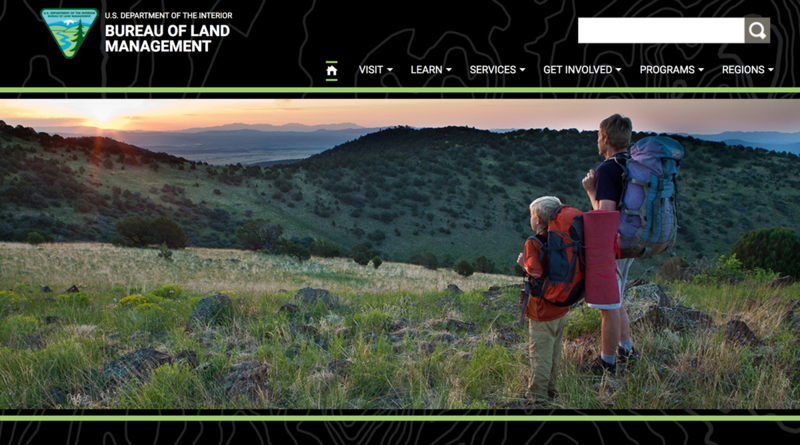 A cached version of BLM.gov from March 25 shows the Bureau of Land Management's home page previously featured a photo of a young boy and his companion overlooking a scenic landscape. A screenshot of the Bureau of Land Management's home page displays a photo of a "large coal seam at the Peabody North Antelope Rochelle Mine in Wyoming." The agency's mission is, after all, to manage federal land for multiple uses — which range from hiking trails along scenic vistas and in remote deserts to oil and gas fields and, yes, coal seams. But on Twitter, environmentalists — along with some satirists — were quick to pounce on the symbolism. The Trump administration hasn't exactly been shy about its plans to increase fossil fuel development on federal land. The BLM is downplaying the latest Twittersphere uproar. More than anything else, spokesman Jeff Krauss tells NPR, the change in home page photos is due to an IT redesign that will once again allow different photos to be rotated through that reflect the agency's multiple-use mission. That used to be standard practice until recently, Krauss says. Despite its low-profile status when compared with other DOI agencies like the National Park Service, the BLM has long been a favorite political target from both sides of the aisle. During the George W. Bush administration, for instance, conservation groups criticized — and sued — the agency for approving a rapid expansion of drilling on public lands. Later, under President Barack Obama, mining groups accused the agency of being too restrictive, and Western ranchers led by Cliven Bundy even led armed standoffs against the agency, protesting its authority to control Western lands. For sure, the stakes are high when it comes to the BLM and the American public's land, which might explain why a seemingly simple photo change ignited as much controversy as it did in this hyperpartisan political climate. Things will probably quiet down Friday, when the agency plans to swap out the coal photo for one reflecting the BLM's recreation programs.